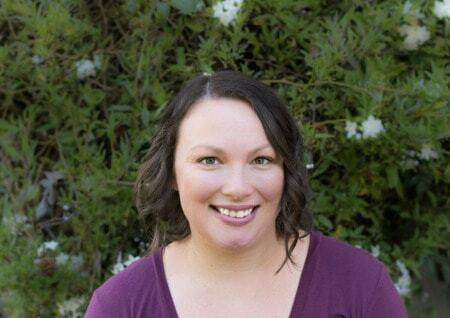 August 5, 2016 By Aileen 13 Comments This post contains affiliate links. As an Amazon Associate and member of other affiliate programs, I earn from qualifying purchases. This roasted garlic three cheese lasagna is the perfect comfort meal. It’s also insanely easy and quick to put together thanks to the no boil lasagna and new Ragu Homestyle Thick and Hearty Roasted Garlic Sauce. The sauce is so flavorful and fragrant, you don’t have to add anything to it. I just pour it directly from the jar into the lasagna pan. This recipe is meatless, so you don’t even have to turn on the stove. Don’t worry, it’s plenty filling, thanks to the blend of mozzarella, Parmesan, and cottage cheeses. Ragu is all about homestyle traditions, which is fitting as I made this for my weekly dinner date with my sister. Every week, my sister and I get together with our kids for dinner and a visit. Our kids get to see their cousins and play and we get to catch up on each others lives. It’s not a fancy dinner date. Our goal is good food and family time. We usually watch a movie or show together and go our separate ways. It’s a simple tradition, but I have come to really look forward and depend on seeing my sister and nieces every week. This roasted garlic three cheese lasagna made our weekly tradition easy. I threw together the lasagna during nap time and kept it in my fridge until it was time to bake it for dinner. Since I’m in the later stages of my pregnancy (6 weeks to go! ), it’s nice to have a meal I can prep earlier in the day when I have more energy (See how I stocked my freezer for the new baby). Looking for more pasta recipes? 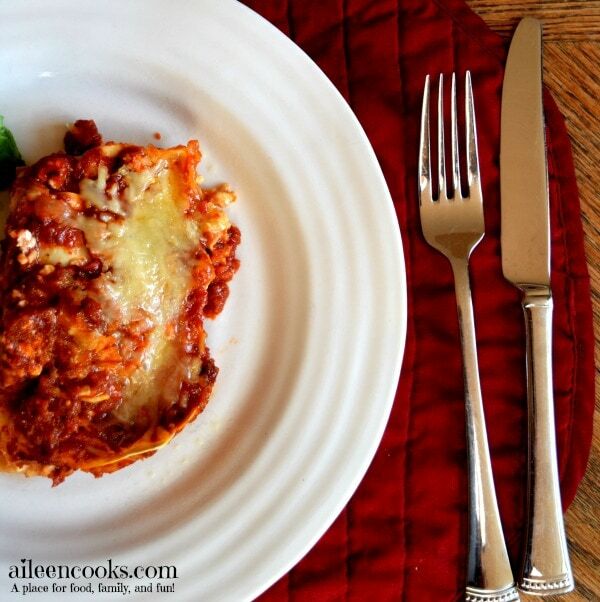 Try this recipe for Taco Stuffed Shells or this recipe for Italian Sausage Stuffed Shells. This is a freezer friendly meal. To freeze: prep the casserole, but do not bake. Cover with 2-3 layers of foil and freeze up to 3 months. To reheat, defrost overnight in the refrigerator and bake at 375 degrees for 45-60 minutes. Check the casserole regularly and remove from oven when hot and bubbly. In a medium bowl, combine the cottage cheese, 2 cups mozzarella, and 1/2 cup Parmesan cheese. Mix well. Pour 1/3 jar of pasta sauce into the bottom of the casserole dish and spread evenly. Place 3 no boil lasagna noodles over the sauce (they will expand in the oven). Scoop one cup of the cheese mixture onto the lasagna noodles and spread across. Top with 1/3 jar of sauce, and 1/4 cup mozzarella cheese. Repeat until you have 5 layers of lasagna noodles. Top the last layer with remaining 1/2 cup mozzarella and 1/4 cup Parmesan cheese. Cover with foil and bake for 25 minutes. Remove the foil and bake an additional 5 minutes, until the cheese is melted. Let sit for 15 minutes prior to serving. Thank you to our sponsor, Ragu for supporting our site and making this post possible. 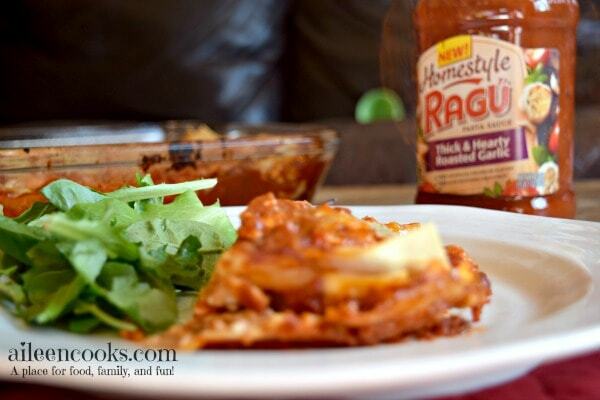 Visit their campaign landing page to learn more about the new line of Ragu Homestyle sauces and find a taste of home. Oh my gosh, this looks delicious! We are big lasagna eaters but I don’t know that we’ve ever added garlic before. Will definitely be following this recipe next time! Well, now I’m starving. This looks delicious, can’t wait to try it! This looks amazing and I love that it is meatless!!! I love Ragu! LOVE LOVE LOVE lasagna and yours looks phenomenal! 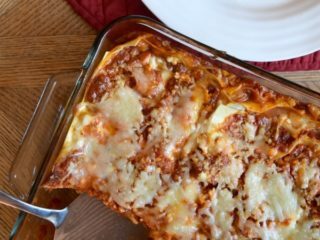 My husband and I are always trying out new lasagna recipes! It’s one of our favorite meals! Can’t wait to give this one a try…it looks delicious! Oh my gosh this looks so good, lasagna is by far my favourite dinner meal! I zia makes it all the time. I love a good lasagna recipe, and this one looks delicious! I’m drooling ? 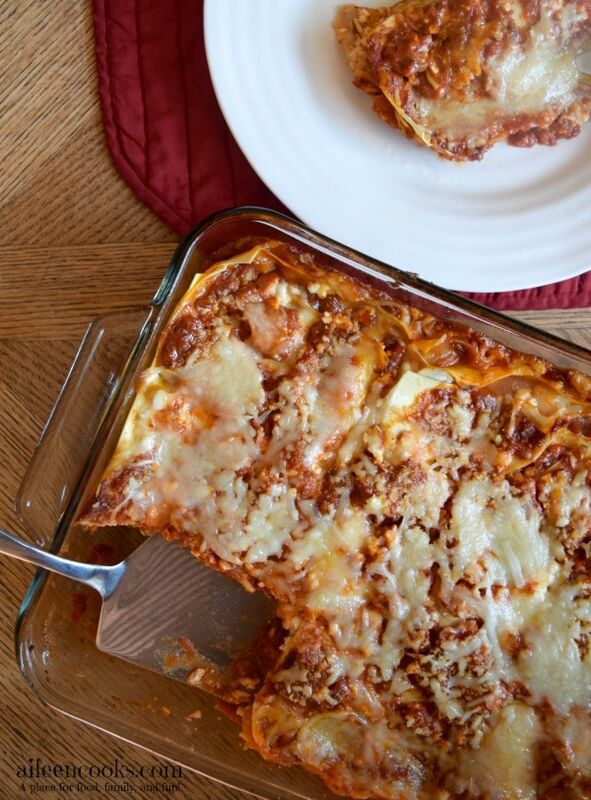 I haven’t had lasagna in so long and this recipe looks amazing! Will need to try it out soon!! I love lasagna, so I am going to have to try this recipe out! Yummy!! I will definitely be trying this recipe soon with my meal plans! Thanks! That looks so yummy!! And I live that you’re able to get together with your sister and her family so often! My sister lives 6,000 miles away, so I’m very jealous!